This site is experimental and the result of research work. 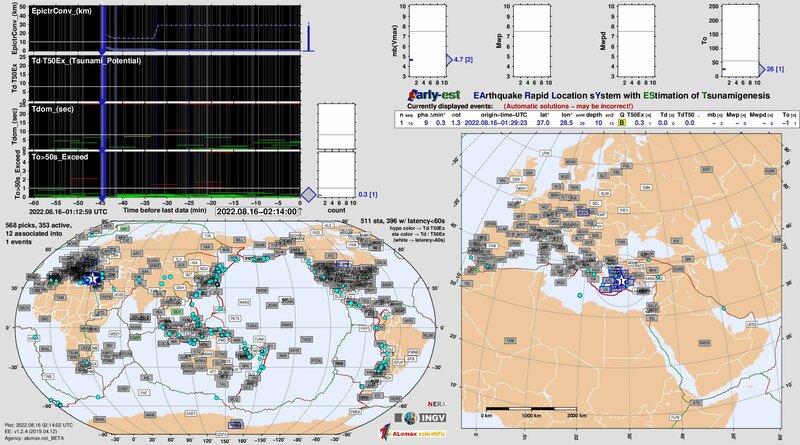 It provides information from a fully automatic procedure that provides very rapid estimation of earthquake location, magnitude, focal mechanism and tsunamigenic potential. The results are NOT reviewed by a seismologist. It is NOT to be used for any operative procedure toward tsunami alert or warning. Relaunching of the information here contained does not make INGV liable of any responsibility and it remains full responsibility of the person/institution/agency carrying it out. Specifically, the earthquake derived tsunami potential is based on the value of the Td*T50Ex Warning Level. This evaluation only concerns the likelihood that this earthquake generated a regional or larger scale tsunami. This evaluation DOES NOT concern the size and effects of a possible tsunami, which depend on details of the earthquake source, ocean bathymetry, coastal distances and population density, and many other factors.) This evaluation DOES NOT apply to and DOES NOT EXCLUDE the possibility that this earthquake generated a local tsunami, which can be destructive along coasts within a 100 km or more from the earthquake epicenter. This work is supported by INGV - Centro Nazionale Terremoti institutional funds and by the EC n.262330 NERA 2010-2014 project. INGV, IRIS DMC, GFZ-GEOFON and GEOSCOPE provided access to waveforms waveforms (SeedLink protocol) and metadata (web services) used here. Focal mechanisms determined using (HASH). Plate boundaries from Bird, P. (2003) An updated digital model of plate boundaries. Plots made with (GMT).